The cold-brew process makes smoother, less bitter and less acidic hot or iced coffee. Steeping the grounds in cold water releases only the most aromatic flavors. Plus the concentrate created from the cold-brew process stays fresh longer than regular coffee. 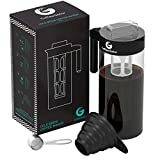 The OXO Good Grips Cold Brew Coffee Maker brings the cold-brew process to your kitchen, offering smooth, low-acid coffee without a trip to the cafe. Just add coffee grounds to the Brewing Container and fill the Rainmaker top with water. The Rainmaker ensures that water is distributed evenly over the coffee grounds. Let the mixture steep for 12 – 24 hours. When you’re ready to enjoy, the Brew-Release Switch allows for easy control of the draining process. The stainless steel ultra-fine mesh filter can be removed for quick cleanup. Once the concentrate is prepared, mix with ice and water for iced coffee or hot water for hot coffee. Milk can also be added. Tea-lover? 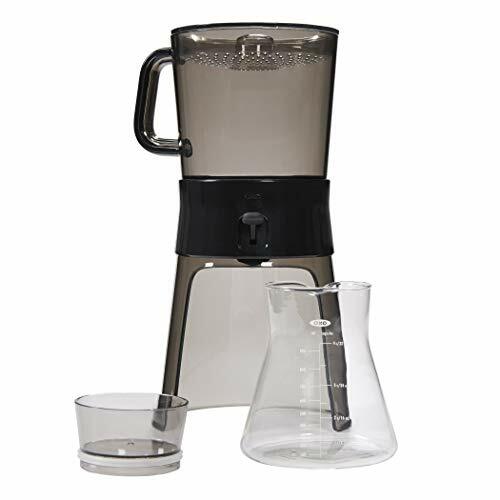 The OXO Good Grips Cold Brew Coffee Maker will steep and strain your favorite tea into sealable, glass carafe. For best results, use coarse ground coffee. 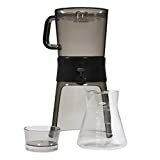 Finer grounds may prevent the OXO Good Grips Cold Brew Coffee Maker from draining properly.